Found between pages 32 and 33 of a copy of The Unquiet Grave by ‘Paulinurus’, this scrap of paper torn from the top left of a sheet. It contains both typescript and manuscript. On one side is the left half of a typed poem, with the rest missing – the demi-title reads DOWN IN SH[…]. There are also a few ms notes in ink, trying out various ways of introducing a girl called Nellie (although the poem is not a limerick). 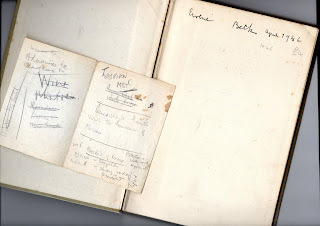 The other side of the scrap is in pencil and includes a short shopping list (wine, marmalade, batteries, hovis biscuits), the words CASPIAN MIST, a note that to Benedictines the fourth vow is The Conversion of Manners, and the words Maltby’s of Oxford, a bookbinder, particularly of theses, and perhaps a clue to the note-writer: a student? There are also definitions of some words: Aureole, Ovine. Aspects of the hand are similar to that of the ownership signature on the free front endpaper, which reads, in blue-black ink Eveline (or possibly Eirene) Beck, April 1946. There is something poignant, even slightly eerie, about these fragments of a life from seventy years ago, caught by chance between the pages of a book. The most evocative phrase, 'Caspian Mist', might simply be the name of a racehorse, or a cocktail. No doubt with some diligent research and detective work, some of the clues here could be pieced together to form a portrait. But even as they stand these stray words seem to convey in an oblique way some sort of story. Thank you, Michael. Indeed, 'Caspian Mist' would have made a great title for another book of meditations by Connolly, or a book of travel by Robert Byron. "Caspian Mist" seems to be a type of pattern, such as would be woven in cloth. Amazon.com has for sale scarves with a Caspian Mist pattern. Since the writer of the note was female, she possibly wanted to buy some clothes with that pattern. It has also been suggested that Caspian Mist might have been a perfume, and a continuation of the shopping list. Somewhere I read that it was believed that the caspian sea was always covered by mist.